Amanda’s displeasure face makes me laugh. The three “devil orphan” kids are in this class, coincidentally (ha ha). The girl is Giselle, the light haired boy is Michael, and the boy with the indeterminate accent is Robert. Ricky Wu and Sandy are in the same grade but a different classroom, and Moonsong and Hamud are a grade lower. I don't yet know much about Chanelle, but apparently she loves math! …She’s still a little insecure brat, though. Ah, Jenny Everywhere, guess her wikipedia page needs to be updated now. Yeah, really. I strongly suggest trimming some of these down to something a bit more plausible. “Ronnie McDonnic”, Dave? “Michael Santiago-Hyrule”? Well remember that the main character in this comic is an amphibious girl. So I think that plausibility is a much more flexible word here. There’s “suspending disbelief”, and then there’s “hanging disbelief by the neck until dead”. ‘Hyrule” is the intellectual property of Nintendo. The name — especially when used as a last name — just screams “I’M A GIMMICKY JOKE REFERENCE AND NOT MEANT TO BE TAKEN SERIOUSLY”. When Mike and Tamara (in Something Positive named their kid “Shazam”, it was portrayed as a really bad decision that will probably open the kid to fierce schoolyard mockery (and it quickly got truncated to ‘Shazzie’). Unusual and obviously-gimmicky first names (like “Selkie” and “Moonsong”) are one thing, but last names are quite another. “Ronnie McDonnic” is… well, there’s the mockery-and-torment-from-other-kids factor, which would’ve been a problem even without Ray Kroc’s Food Empire. Truncating it to “Ron” would sound much better (so would extending it to ‘Veronica’, but then the allusion would get lost). That said, at least it’s a plausible name. An unfortunate one, but plausible. A last name involving “Hyrule” is not. “Jenny Everywhere” gets a pass because she’s Jenny Everywhere and she’s everywhere. Yeah I think I may trim some of these back for the “official” posting. I had trouble thinking up names and just went a little crazy, methinks. “Lisa Monet” was pretty brilliant though, in my opinion. This was meant as a reply to Aita’s comment below, but I’d forgotten it wasn’t under the correct reply I started out from. My bad. I don’t get alot of the references, so I don’t think they’re so awfully out there. Only if you get them will you get them, and I like those kind of inside jokes. Going to throw out that I have a friend who’s middle name is legally “Hyrulian”, as well as a friend who’s last name is Immortal, and I also have a friend who named his kid Francis Xavior (last name withheld). Your “plausible” doesn’t take in that 1) new-age parents could allow their kids to pick their names and 2) in the US, there’s only an official registry of SSIDs: as long as you aren’t doing it to commit a crime, your legal name is whatever you call yourself, end of story. I have many legal names, and in fact do business under many names, most of them chosen myself or things I was dubbed with in Highschool were more people know me by my nickname/chosen name than by my given name. I mean, yeah, the artist wants to cut them, but that’s different. It *could* freely stand, with the associations with them. It’d be an interesting arc to see who and what a kid is if they choose things for themselves, as I was (mostly) allowed to. Not so. You do have a legal name; unless you’ve had it changed in court, it’s whatever is on your birth certificate. You’re welcome to go by whatever name you like, but you cannot, for example, get a credit card as “Jackie Frost” if your name is actually Joe Schmoe. Well when an artist/author does something I don’t like I shrug, remind myself that it’s their comic and move on. If it gets too bad I stop reading and that’s it. I work with names… for a living…. I shuffle bloody tons of client data on a regular basis, and have seen some of the silliest legitimate names known to humankind. And I declare a last name including “Hyrule” is perfectly plausible. I’d share some of the funnier names I’ve come across… but I’m not allowed to. Privacy rules and all that. Needless to say though, the number of people with names that sound exactly like words for genitalia or mating practices is well into triple-figures by now. Possible, but I know that if *I* could have gone to school with both Magneto and the sheriff of Piltover, I’d have been a happy camper. Amanda is taking her emotional insecurities too far, in my humble opinion… But then I’ve never been fond of bratty responses. Wednesday Addams did it better, anyway. Naturally. She’s an Addams:) I’m a big fan of the Addams Family, both the comic, black and white series, and the two movies (not counting the crazy horrible last one…) Loved ’em so much I started writing a show sequel;) It works for the Addams Family if you understand that they started out as a newspaper comic which seems to openly criticize popular stuffed-shirt-edness and other elite or proper things to do or say, and then it just turned creepy and kooky and fun! It would be interesting if the teacher were to step in now and constructively chastise Amanda; major jealousy and anger fuel. Aw, the X’s are just so sad. Why’s Selkie at the back? Isn’t this still where the short attention spans congregate? “Opportunities for misbehaviour are inversely proportional to proximity to the teacher”, in the words of Martin Prince. Not to sound bossy, but tell me everything you just referenced in that sheet. Please. Caitlyn Piltover is a League of Legends character. Erik Magnus is the real name of the X-Men villain Magneto. Proudmoore is the last name of a World of Warcraft charater. Lisa Monet is a children’s musician. Hyrule is from the Zelda games. Jenny Everywhere is the name of an open source character that pops up here and there. There is a disclaimer you are supposed to post if you use her, but I didn’t do that since I haven’t actually drawn her yet. Oh, thank you, I got Hyrule and Jenny but the others escaped me. waitaminute. Don’t tell me you have an LoL account. If, by chance, you happen to recognize me as the guy that lost bottom lane and fed Tryndamere 15 kills… sorry about that. XDDDDD Pyraheart. I haven’t seen you anywhere before, but I can guarantee that I am just as sucky. Loving the comic so far, I’ve been reading since right after Selkie found out she was adopted. Oh man, I usually wouldn’t comment on comics, but Caitlyn Piltover… brilliant 😀 And i think it sounds realistic too. Wait a sec… Erik Magnus? Is that a Magneto reference, or am I too much of a nerd? On the seating chart, what parents requested the * name to not be disclosed? I don’t need an answer if it’s too much of a spoiler. It’s probably meant to be a secret at this point, but I figured that I’d ask anyway. Giselle, Michael, and Robert? To me they will always be Ponytails, O Gross and Forrest Gump. Incidentally, Dave, your artwork is really evolving very rapidly. The expressions are delightful. Amanda’s face in panel 7 leads me to believe she’ll age badly. When a girl makes faces like that too much she ends up looking like the Mangalores. I like Chanelle. Math test? Aw yeah! What hell can she give her that she hasn´t given her already? Calling her “Fishface” gets kind of old after a while. Except that now, of course, Selkie can reply: “That´s Fishface *Smith* to you.” Just to rub it in a little who´s been adopted and who hasn´t. Not to be a grammar Nazi, but publically is really publicly. 😀 But other than that, molto bene! It’s ALSO publically. Both are right, just alternative spellings. Is Jenny Everywhere a niece of Jenny Anydotts? Who is Kristine’s mother? I wanna know who you ship Darwin with. Selkie should take her frustrations out on the school and pull the fire alarm or write a bomb threat and put it in Amanda’s locker, or eat the class pet (if there is one). Would it be too much to ask if there is going to be some questions on that test that the kids “shouldn’t” be able to answer? That’s interesting, I honestly hadn’t thought about the idea. I may try and work that in somewhere. I would have assumed that the orphans might all have the name “Jones” or something. Ok, I guess that works, but does that mean that all the kids with “X” were anonymous surrenders? For example, I would guess that Hamud (new kid, from a few weeks ago) would have a last name, he would have had one before his parents abandoned him. Yes Hamud has a last name, and thinking about this made me realize Tony SHOULD have a last name too (It hasn’t been mentioned in the comic yet, but Tony’s backstory means he SHOULD have a surname. Woops). I think I will take your advice and change the Xs to Does while I’m at it. 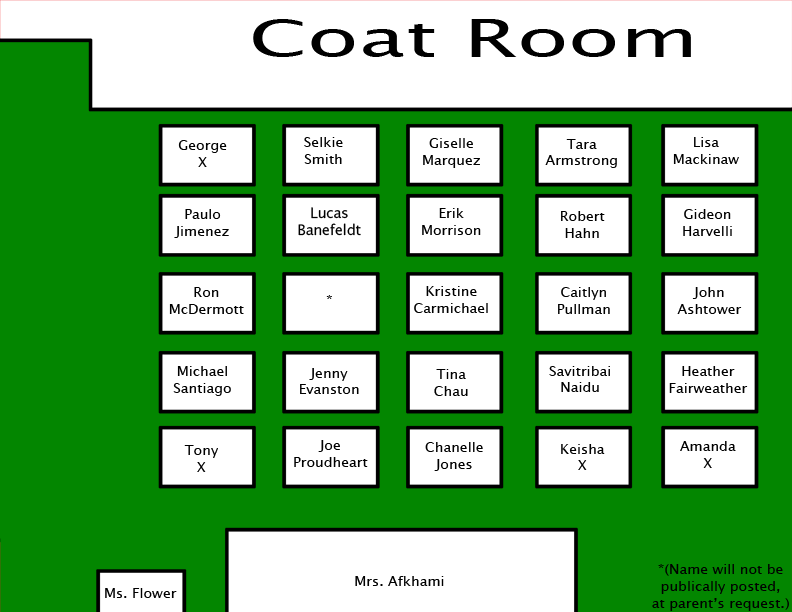 Expect another seating chart re-write soon! That´s yet another thing to like about your comic: You´re always open to making changes if a reader brings up a good point. mmExcellent. Your commitment to realism and your selflessness is making this a great comic.